In the old days, billers were at the mercy of the efficiency of the Post Office in getting their bills through to customers. Remember not knowing whether your invoices would ever reach customers during the days of postal strikes, mail delays and outright theft? While the Post Office is far more efficient these days in delivering physical post, technology has enabled billers to choose even faster routes for delivery. The fastest of the lot being email. Getting your bills through an increasingly complex email landscape is today’s version of the old postal challenge. eBillers and their outsourced ebilling providers need to jump through new hoops to ensure the delivery of their email bills. These hoops come in the form of various spam filters which are implemented to reduce the amount of unwanted email coming in to the organization. In short, billers want to get their legitimate email bills delivered. Email administrators want to block any emails that could be deemed as spam. This conflict of interests has spawned a whole new set of processes and relationships that are required to realize the benefit of email communication, while minimizing the frustration. The Internet was initiated as a network of machines. Now it’s also a network of individuals who need to form relationships in order for their organizations to work efficiently. The email administrators of an organization need to have relationships, not only with each other, but also with the many Internet Service Providers in order to ensure that the right kind of email gets delivered. And the wrong kind of email does not. There’s whitelisting, greylisting and blacklisting going on in server rooms all over the world. There are accreditation and sender authentication processes being developed in IT departments worldwide. There is content scanning, firewall rules and email monitoring systems all being used in the bid to relieve networks of unwanted email. All these development contribute to an increasingly complicated email landscape. 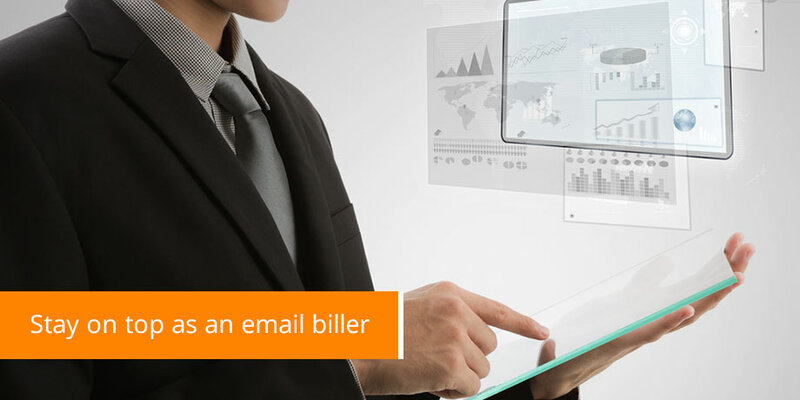 How does the email biller stay on top? Monitor your delivery reports. If you are sending out regular ebills, it’s imperative to have someone checking your delivery reports. This is the easiest way to see what domains are blocking messages from your server. Look for a high instance of email failures to a specific domain. Have an email administrator assigned to contacting those organizations and getting your email servers onto their whitelist. Remember that this is not a once-off process. You may have to repeat the exercise regularly with the same domains depending on their rules. Stay in touch with spam ratings. Although different spam filters use different rating systems, there are a couple common words that email senders should stay away from. These are words which are popular with spammers, such as ‘free’ and ‘click’. The best way to check your email for words that result in a high spam rating is to send the email through to yourself, and ask your system administrator for the spam rating report. Be aware of common email size limits. In the business to business environment especially, bills with masses of transactions can become quite sizable. Be cognizant of the common limitations on mail size set by system administrators, and build rules into your ebilling process to deal with these exceptions. Most businesses allow emails of up to 2 Megs, but no larger. In the consumer environment, be aware that some of your customers might be on dial-up. That means that files over 100kb take a while to download and can cause frustration. Watch your email formats. Pretty pictures and nicely formatted text might look good, but in some instances, HTML formatting will be the reason an email doesn’t get delivered. If a system administrator has decided that HTML coding or embedded graphics are potentially harmful, then an ebill attached to an HTML email might not make it through. Experiment with your recipient base to see if your delivery rates improve if you send the ebill attached to a plain text email. There might need to be a compromise between cosmetics and deliverability. While email billing provides many benefits, such as faster billing cycles, customer self-service opportunities and measurable delivery statistics, it still needs to be nurtured and monitored to achieve maximum success.